Note the imminent collapse of the world’s banking system and the welcome for the great progressive government just formed in Italy as part of a “revolutionary movement of workers and youth that is already up in arms”. Yes, that’s right ITALY HAS A NEW ANTI EU, ANTI AUSTERITY COALITION GOVERNMENT we learn with absolute astonishment. “What is clear is that no amount of restructuring can save Deutsche from a collapse that will bring down the eurozone and precipitate a crash of the entire world banking and financial system. The collapse of the US investment bank Lehman Brothers in 2008, a collapse that wiped $10 trillion from the global markets overnight, was the start of the unravelling of the entire debt-laden capitalist banking system and now Deutsche looks set to complete it. Anthony Brain apply Trotskyism for today and tommrow! There are signs that layers of the WRP leadership are qualitatively degenerating. They cannot tell the difference between radicalisation and reaction by implying the vote for the Five Star movement and the League in last Sunday’s Italian general election represents a radicalisation. Then we have the outrageous statements from the WRP in their daily paper (the Newsline) that Trump is carrying out trade tariffs on steel and aluminium not for a layer of capital to keep their market share of profits but only to incorporate layers of the American working class. It is important to record the latest stage of the WRP’s degeneration in order to learn the political lessons. 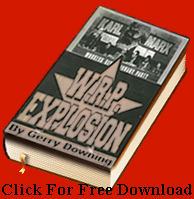 American Trotskyist Joseph Hansen recorded the degeneration of the WRP and their predecessors the Socialist League (SLL) during the 1960s and 1970s..
« Why the Unfolding Mass Radicalisation and Possible Revolutionary Upheavals within Britain are Key to Europe and the World in Salvaging Humanity from Barbarism!